This is a true real rags-to-riches story about a 1-year-old orange tabby, found scrounging for food near Hempstead, LI, and now he’s chasing toy mice, cuddling with adoring humans and exploring posh surroundings at Manhattan’s elegant historic Algonquin Hotel. Read the full story here. 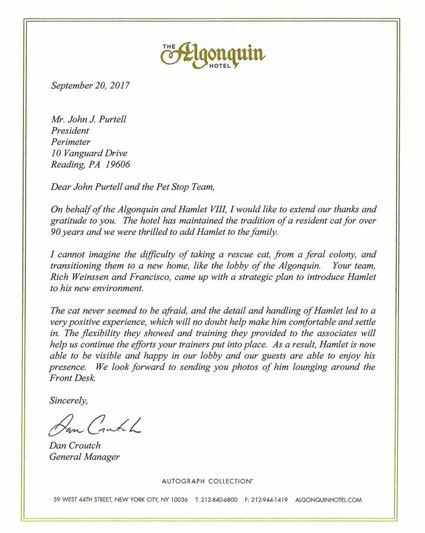 Thanks a Pet Stop system and one of their top Dealers, Richard Weinssen of Hidden Fence of NJ Hamlet is now trained and assuming his place as the resident cat. Read what the Algonquin Hotel had to say here.